As the VP of hospitality for Green Flash Brewing Co., San Diego native Dave Adams is essentially in charge of creating magical experiences for guests at every point of contact — the tasting rooms, restaurants, tours, and even merchandise sales. The dearth of responses suggests that great experiences are as rare as the optical phenomena after which the brewing company is named. Fortunately for students, Adams shares every ounce of his wisdom and experience in his much-needed course. Adams answered some questions about his career and his course. I began my hospitality career at the Corvette Diner as a busser when I was in high school. I eventually moved to Stone World Bistro and Gardens to be on the opening team for the restaurant. Churchill’s Pub & Grille eventually became my new home where I was the beverage coordinator. Being down the street from Green Flash, I developed a relationship with the crew there and eventually joined the team in 2011. How did you come to be an instructor with SDSU’s Business of Craft Beer program? I received a letter during the inception of the program that I was nominated to the board of advisors. After meeting with the program director and trying to identify deficiencies in the industry, we settled on a Front of the House-focused class that covers everything from concept and design to POS systems and beer lists. I was afforded the opportunity to alternate teaching the class with my good friend and beer wizard, Justin Evelyn. I like that the program is more high level than others with a focus on the actual operations of the business as a whole. It’s a well-rounded program that’s a fit for most folks looking to begin or bolster their career in the beer industry. Tell us a bit about your course, Front of the House Management. The FOH Management course is designed to give students the tools to succeed when opening or improving a tasting room, bar, or restaurant with a focus on craft beer. To start, we discuss how to create a flowing floorplan and key elements of construction to consider, setting yourself up for success from the jump. From there, we move into draft system theory, staffing plans, POS systems, and steps of service. We finish the class with an offsite visit to Green Flash where they get to see the theories they’ve learned being applied during operating hours. Most of what we do revolves around classwork although I do like the students to be more observant and critical when they’re out at a bar, restaurant, or tasting room. I also like to have them make notes of any exceptional experiences they have, to share with the rest of the students. The best thing about teaching is actually seeing someone take a job or get a promotion related to the class. To hear them reflect on their experiences in our class that propelled them to be where they are now in their career is an amazing feeling. What advice/encouragement do you have for anyone wanting to enter this field or take your course? I always advise people to be humble and keep an open mind. No matter how long you’ve been in the industry, there’s always more to learn. There’s nothing wrong with saying “I don’t know.” It’s significantly better than making up an answer that’s false which leads to the spread of misinformation. From an encouragement standpoint, I try to remind everyone that we’re still a young and growing industry with plenty of innovation and growth to go. Strive for constant improvement and have fun! When/where did you have your first great beer and what was it? My dad and uncle were both really into the San Diego craft beer scene when I was younger and I also helped my dad homebrew when I was 15 or so. I don’t remember a specific “first great beer” story but there were several times throughout my life that I had some really amazing experiences with beer. Visiting Belgium was full of crazy experiences. I took a private tour of Chimay, drank a 14-year-old Chimay Grand Reserve, saw their amazing packaging facility, and ate cheese from their creamery, all in one day. We also got a tour of Brouwerij 3 Fonteinen from Armand who tapped a wooden geuze barrel in process for us to taste. I thought I was going to lose my mind. I’ll do GF and non GF as to be unbiased. GF: Bière De L’Amitié (collaboration with St. Feuillen), Flanders Drive, and Tropical DNA. Non-GF: Most Cantillon beer but Lou Pepe Framboise is pretty amazing, Russian River Blind Pig, and The Bruery Hottenroth Berliner Weisse. 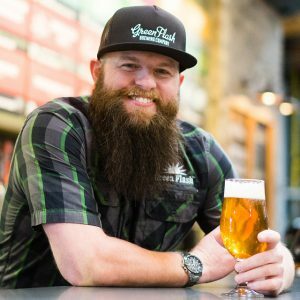 Tell us about Green Flash’s new operation in Lincoln, Nebraska. And why Nebraska? The Green Flash Brewhouse & Eatery opened on June 4, 2018. The space became available to us toward the end of 2017 and it just seemed like an opportunity we couldn’t pass up. The location is very close to the University of Nebraska-Lincoln on 16th and P Street. Having a brewpub in a location outside of San Diego enables us to have an amazing customer connection point to share our passion with the folks in Lincoln. It’s a fun space that’s making amazing food and one-off, Lincoln-only beers. I played baseball my whole childhood so it was obvious to me that I was going to be a baseball player. I was a lefty pitcher and was actually pretty good. I ended up tearing a ligament in my arm when I was 18 and had to figure out a plan B. Beer eventually became my calling as soon as I was of legal age.